The 2013 Meursault Villages has an appealing bouquet with straightforward apple blossom and citrus aromas. The palate is well balanced with impressive weight in the mouth, a keen thread of acidity and pleasant, orange zest and hazelnut notes on the rather conservative finish. Satisfactory if not remarkable. The 2011 Meursault Village is the first to be blended with the parcel of Clos des Baronnes acquired from Domaine Manuel. It was assembled in tank around January and bottled around early June. It offers an attractive bouquet with hints of wild honey, orange blossom and quince. The palate is refined on the entry but then motors up a few gears toward the finish with hints of brioche and popcorn infusing the citrus fruit. There is good richness here for a Village Cru. Drink now-2020. 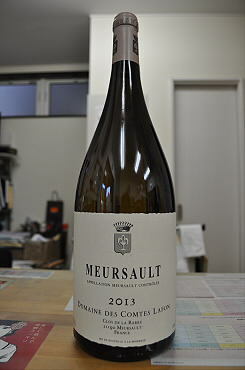 The 2009 Meursault is a classy, understated wine laced with white peaches, pears and flowers. It reveals attractive inner sweetness and perfume with a refined, polished finish. Anticipated maturity: 2012+.